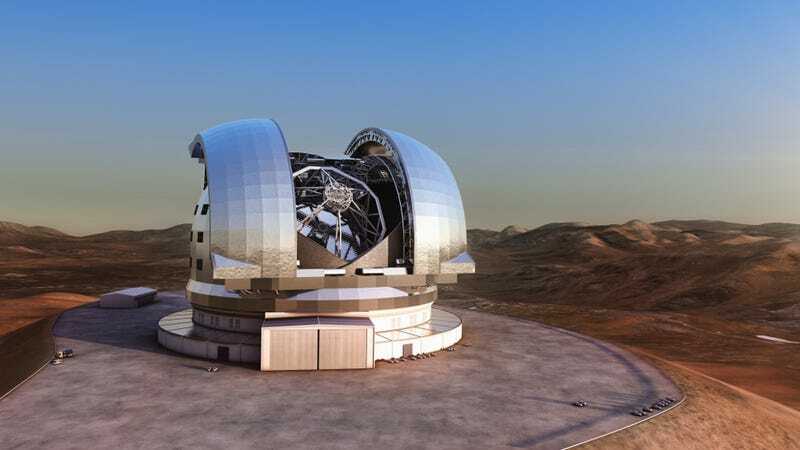 The European Southern Observatory is ready to blast the top of Cerro Armazones to make room for what will be the world's largest optical telescope. The explosion is scheduled for today, June 19th, at 12:30 pm ET. You can watch it live right here at io9. The explosion is set to happen between 12:30 - 2:30 pm ET. You can track the live webcast and updates directly through the ESO. Once complete, the European Extremely Large Telescope (E-ELT) will provide insights into the earliest formation of planetary systems and the potential for life to exist elsewhere in the galaxy. The telescope, which will be operational early next decade, will feature a 39.3-meter diameter primary mirror, a 4.2-meter diameter secondary mirror, and will be supported by adaptive optics and multiple instruments. Given its unprecedented size and design considerations, E-ELT will allow scientists to look deeper and more clearly into space than ever before.